I went to work yesterday, and as soon as I got there I felt like it was a huge mistake. I would feel okay, then I’d feel worse, then okay, then worse. It was a super vicious cycle, and I did not enjoy it one bit. Thankfully it was only a half day and the kiddies were watching a movie during part of the day. I would have died without those things. But finally the day ended and I went to the store to buy real food. I bought some apples, bananas, strawberries, a tangelo (just for kicks because I’d never had one before), baby carrots, romaine lettuce, a cucumber, 2 yogurts, pomegranate/blueberry juice, a loaf of bread, eggs, a can of chicken noodle soup, and meats to freeze. By god produce is expensive here, even where I went. I didn’t go to Trader Joe’s this time, simply because I knew I would not physically be able to make it there . . . curse you, you stupid cold. Anyway, I made it home and made a rather large salad for myself. Granted the salad was only made up of lettuce, carrots, cucumber, and balsamic vinaigrette dressing, but it was yummy and “healthy”. Later that night I went for some strawberries, and I noticed something was “off” with them. They looked perfectly ripe and ready to eat, but upon first bite, they tasted funky. It took me a while to figure it out, but I realized they smelled and tasted like PUMPKIN! Now, I have NO idea how that happened, but I didn’t want to let the strawberries go to waste, so I cut and hulled them and sprinkled them with a teeny bit of sugar, then left them in the fridge to macerate overnight and become more “strawberry-y”. It worked. This afternoon I ate strawberries that actually tasted like strawberries and not a fall gourd. That was so bizarre. I must admit that not all of my food choices have included something green today, but neither were they “unhealthy,” or at least not terribly so. I woke up around 11:30 after a wonderful night’s sleep, so breakfast time was kind of over, and I wasn’t really feeling the breakfast options anyway, so I made a peanut butter and jelly and ate a few strawberries with it. 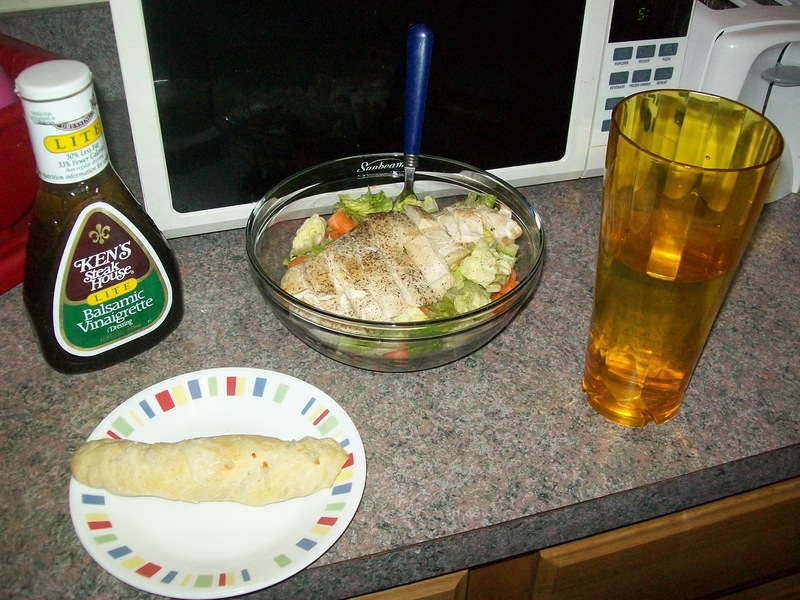 Then for dinner I made a large salad and added some chicken. It was too large. I couldn’t finish it all. So sad. I also used some leftover pizza dough to make a breadstick and sprinkled a small amount of mozzarella cheese on top. A girl can’t survive on salad alone. Sometimes I need some cheese-y goodness. And so ends another stay at home. My break here has ended, and I’m getting back to the city to work for a couple days and then begin classes the week after. All I can say is, I’m not sorry to be leaving. Three weeks here is more than enough, but I think I’ll miss certain materialistic things about being home, ie having a couch to lounge on while watching tv, having lots of counter space on which to make messes while baking, sleeping in a queen size bed, being able to have lots of sun coming through ample windows, having a light and airy atmosphere because of the sunlight, and the general cozy feeling I’ve been experiencing here. All in all, I want to get back to school and resume my hectic life, albeit I could do with a little less hectic and a little more calmness, but where’s the fun in that, may I ask? I still have some time before classes are in full swing, but work will keep me busy in the days leading up to it. I look forward to Tuesday when I go back; I haven’t seen those kiddies in five weeks, and I can’t help but think that maybe they miss me? Maybe I’m thinking too highly of myself, but if I miss them, who’s to say they don’t miss me as well. I took a trip to my local Michael’s today in order to spend a gift card before leaving, but I have to say that I actually had a hard time spending money there. I went with the intention of procuring adorable fabric, fleece, and a matching button, but I was sorely disappointed. I found out that they no longer carry fabric squares or fleece. What kind of craft store is that? On a whim I looked for some Sharpies in assorted pretty colors, but oh look, those were no where to be seen either. I didn’t want a large set for $30, but just a couple of pretty colors sold by themselves. After wandering around for nearly 45 minutes, I ended up with only some new sewing needles in their own little case, two pieces of felt in a gorgeous shade of pink, a shamrock cookie cutter, some shamrock muffin tin liners, and a calendar on clearance for $0.50 (for my parents). It all came to a grand total of $6.35 . . . and I still have $18.65 to spend who knows when, because to the best of my knowledge, the closest Michael’s is up on Columbus Ave in the 90’s, and I’m not spending $4.50 in subway fare to get there and back. I wish they had an online store, but I guess that’s too much to ask, seeing as how they can’t even stock fabric anymore. I must give them some credit for their assortment of stickers though, it was very amusing to look at all of the adorable sets. But I guess today was at least a minor success. I managed to spend (with the help of a friend) a Panera gift card that had been sitting in my wallet for three or four years. I also found two pairs of flats at Payless; they don’t stand a chance if I wear them outside to walk to work/home/class, but I can wear them inside while I’m at work or in class. There’s no way I would last the day wearing my big heavy boots, so until I get some all-purpose, sturdy as heck, miracle shoes, this is the best solution I have. While I was packing up my things tonight, I looked at my clarinet case sitting at the foot of my bed, and for the first time since the end of senior year, I opened it and put the two center barrels together. I want to bring it back to school with me and try to play. I realized during my Celtic music course that I really miss it. Band was a part of my life from fifth grade, right through high school, and I can’t believe I just cast it aside once I got to college. Something that meant so much to me shouldn’t have been so easy to let go and to allow to fade away. I don’t want to let this go on any longer; I won’t be playing on a strict, daily schedule, but if I could at least get my clarinet out once I week I think I could get my abilities back soon enough. I probably won’t be playing some of the more extreme pieces I encountered in high school anytime soon, but just to play some scales and simple tunes would be wonderful. I used to get so much enjoyment out of it, and I want a bit of that old part of me back. It won’t be the same, but it will be something, at least. Oh look! I’m using this entry as a means to procrastinate. I’m no where near done packing, and I leave at 8:30am. . . . It’s not even worth it to sleep now. I can sleep in the car, and that way I’ll hopefully avoid the sick to my stomach feeling I’ve lately been getting on buses when I travel. I’ll pop in my ear buds, listen to some good music, and sleep the hours away, like I *should* be doing right now. Instead, I’m blogging and watching the first season of Merlin–not a bad alternative, but not the best thing to be doing at the moment. It wouldn’t be finals without being sick. I went to bed Monday feeling slightly off, and I woke up Tuesday completely destroyed. I essentially lost the entire first half of the day because I could not function. Being vertical was a very bad idea, as was any sort of movement beyond blowing my nose. Yay writing papers, studying for exams, and doing presentations in these conditions. Thankfully the worst has subsided and death by finals can recommence. Oh joy. I think midnight breakfast is tonight, so it looks like the anti-midnight breakfast will be occurring in my room. I just need to buy eggs and then the scone-baking can begin! I’m thinking blueberry and then raspberry-lemon ones. I need to use up my lemons, as well as my partial bag of frozen blueberries. Maybe this excitement will help me to stay up past 10pm . . . because that hasn’t been working otherwise. I NEED to get work done sooner, much rather than later, and being able to function past 8pm would greatly help in that endeavor. Let’s see how that works out for me. Edit: Yeah, no anti-midnight breakfast midnight breakfast for me tonight. I’m terrible at having the materials I need when I actually need them. At least I’m still awake and functioning? Although I might have just jinxed myself there with that comment *knocks on wood*. Must. Do. Work! It’s becoming increasingly irritating that I can’t upload any photos to my entries, because what’s the point of the entry if I can’t show off what it’s about? I want to know what’s wrong with this feature and when it’s going to be up and running again, because I actually have stuff I want to post about, but can’t at the moment. How else am I supposed to legitimately put off all of the reading I have to do, even if it’s just for a short time? At the moment, I’m waiting to post about 1 updated Keroppi, 1 dessert, 1 breakfast, and 1 super sad CT fan that can’t go to the show taping this Friday night even though it’s less than two hours away by Metro-North. *sigh*, Such is the life of a broke college student. If only I could find a decent way to survive without needing to buy groceries or spend money on food, then I would be able to afford the ticket and I wouldn’t care about having to stay in Poughkeepsie until 4:40am when the train would arrive to take me home. I could have sworn that I said to myself that I was going to the next taping, no matter what, but I guess things changed a bit since last October. I guess I’ll just have to wait two and a half weeks for the first of three shows I’m going to. At least nothing’s stopping me from hanging around Radio City alllllllll day long that Friday. If I manage to snag some face time with Keith and Damo to speak some Irish with them, I guess I’ll be okay. Haha. I’m all moved into my academic year housing, which means that I’m finally reunited with a kitchen in which to create delicious treats and actual meals. Or so I thought. . . . I really wanted to make some scrambled eggs in a skillet today, because really, microwave eggs don’t even compare when they’re being eaten alone. Happy me turned on the stove, mixed up my eggs and milk, and waited for the pan to heat up. To my dismay, it never did. I checked to make sure the burner was on: it was. I tried turning it off and then on again, thinking maybe I had to push down on the dial more: nothing happened. I tried all the other burners, and they were ALL DEAD. The oven appears to work, but I don’t have anything to make in the oven, since I haven’t gone grocery shopping, nor do I have much of my kitchen cookware. I didn’t think I would have to rely on the microwave for my meals once I got here, but boy was I wrong. I submitted a work request, so hopefully someone will come soon and fix this stupid stove so I can eat real food again, since that’s been somewhat of a rarity since the dining halls closed on the 6th and I was living without a kitchen until now. Come on stove, behave yourself and work like you’re supposed to. You’re really not giving off a good first impression with these shenanigans, now are you? I didn’t think so. Please start working so I can make delicious things with you. The heatwave that plagued NYC last week claimed more than just the lives advertised on the news. Early last week, I had to say goodbye to Fishy-Fishy, who perished in his bowl because I could not keep the water cool enough in my boiling room. Late that night, my suitemate and I had a funeral for him, expressing our anguish at his loss and our anger at the heatwave for taking him from us. Fishy-Fishy was a good fish. He served my classroom well, and provided companionship for his bowl-mate, Fishy. At the moment, Fishy seems to be doing okay without his friend; he’s eating and swimming, so I won’t be too worried about him. He’s a tough little fishy. In other saddening news, the heatwave also claimed Catherine’s life. I’m sorry to say that she didn’t stand a chance against the unbearable heat in my dorm, which resulted in her leaves essentially being fried to bits, even though I watered her profusely. I wanted terribly for her to pull through, but it was all to much for her to handle. She was such a young kidney bean plant, and I was so pleased with her progress before the heat hit. She will also be missed. Her side of the windowsill will remain empty for the time-being, as a testament to the emptiness which I feel when I look at that section of the window. I hope that the remainder of the summer will be free of loss, as this has been a lot to handle recently.